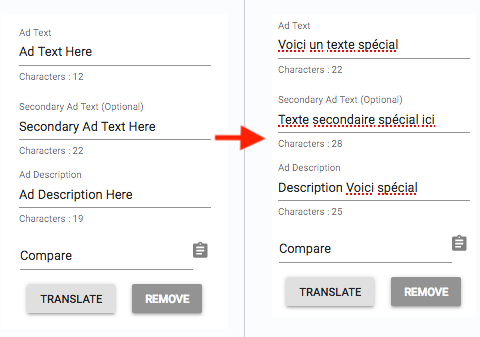 Language translation will alter the length of text and may cause it to go over network limits. The text that can be translated depends on the network of the campaign. Fields for that campaign will show up depending on the network. In this image, a Gemini campaign is adding an image from the side menu on the Campaign Details page. Only user entered text will translate. Choosing options like Call to Action which are set by the network will not be translated.